After a brief overview of the origins and development of the city of Odessa on the Black Sea Coast, author Nikolai Ovcharenko turns to its citizens’ ordeal during the Second World War. In the process, he describes the heroism of the city’s defenders and residents in the summer of 1941 on the land, sea and in the sky, when defending against insistent Romanian attacks. 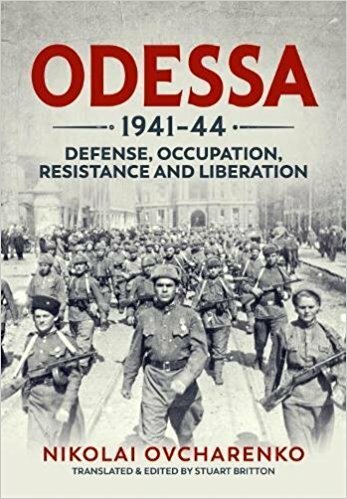 Exploiting the numerous estuaries on the Black Sea coastline, which served as natural defensive lines, under the weight of numerically superior Romanian forces, Odessa’s defenders successively, fell back into the city of Odessa itself. Once the situation became critical, a valiant counterattack in part with naval infantry gained valuable space and time for Odessa. Eventually, at a time when German forces had advanced far to the east and were approaching the critical naval base of Sebastopol in the Crimea, the decision was made to evacuate the remaining Soviet forces from Odessa. There ensued more than two years of occupation and underground resistance; the partisans and activists made use of the extensive catacombs underneath the city of Odessa. The occupiers scored successes against the underground movement, which Ovcharenko details in succeeding chapters using contemporary newspapers and interviews with surviving eyewitnesses, but were never able to stamp out resistance completely. Finally, in the spring of 1944, Odessa was liberated by forces of the advancing Third Ukrainian Front. Ovcharenko describes this offensive against forces of the resurrected German Sixth Army.